I have issue with keeping muscles and losing body fat. When I try to gain I gain 1:1 muscles vs body fat or sometime more fat and same wise versa losing time 1:1. When Looking lose more muscles than fat. Currently I am 147 lb weight and 15.6% body fat% at 5.7ft height. I am doing workout from many years but not every months with strict diet and strict program. I am software eng. So very normal office job/simple sitting on chair. From Last 5-6 month I am doing very proper program and very strict diet with some nutritionist's help. Did varieties of program and changed at every 5-6 weeks. Eating 6 times a day and counting all my calories. Eating ratio changing depend on gaining or losing. (25%f/40%c/35%p) or sometime for shredding (25%f/25%c/50%p). Eating depend on plan between 1600-2600 kcal. Also I am pure vegetarian. And I don't do cheating or cheat meal and tracking all my workout and nutrition with myfitnesspal. Working doing great with proper Tempo and proper intensity. See here is my last few month's weight tracking. Only one time I got proper result that I know when I did circuits and strength training. Now what I should change or try? My goal is 165lb with 10% body fat. So as per that I lost 7.3% bf, 12 lb fat and gain 6 lb muscles. I am little bit confuse with that result. If it's really true than I did great progress. This is more of a comment but way too long to put in comments. Your graph is flawed to start with. Your body is made up of more than fat an muscle. I know you are simplifying things and I get that but you have a set of "bone"/organ weight and you have water weight that will move drastically from day to day. 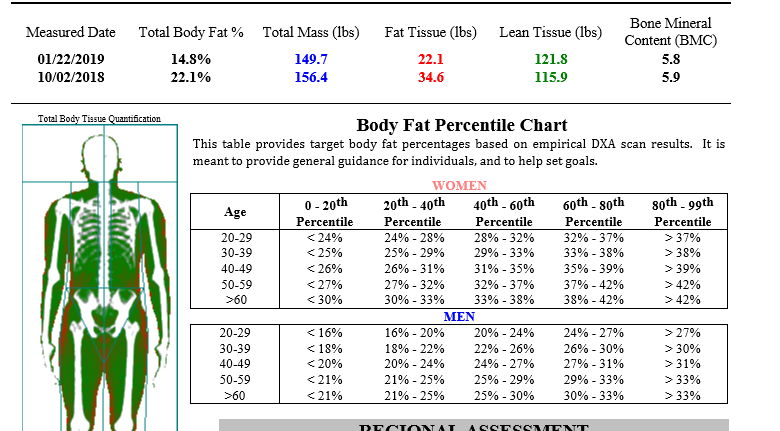 The other thing that is flawed is the calculation of body fat percentage. Unless you are being submerged in a water reader, the chances of this being accurate are very low. For instance if I run and fast for a half a day I can be read at 1% less body fat. Did I really lose 1% of my body fat by running and not eating? Next your focus is not correct. I am not sure I am defying new logic here but I have trained people for over 25 years and was once lifting enormous amounts for my weight. Point being you are tracking muscle when the goal should be strength. Of course you are not going to keep strength by yo-yoing your caloric intake and routine all the time. And the results you are seeing are the exact results that almost everyone sees with this pattern. Nothing. You gain weight you get more "muscle". You lose weight you lose "muscle". Look at your ratios - you might as well just measure your weight as the other two variables aren't moving independently. The only way out of this circle is to defocus on weight and calories and put your focus on strength training. For the short term caloric intake should be ramped up by 20-30% and include a balanced diet. You should get on a sustainable lifting routine that is high intensity with a low time commitment you can do 4-5 times per week. It is simple don't do this and expect the exact same results for years. Workouts should focus around your core but can certainly include shoulders, chest, and arms. The problem you have is that you don't have the body foundation to handle not strength training for your expectations. You can't gain 25 pounds of muscle (doing the math you want to gain about 18 pounds and lose 7 pounds of fat) without eating a ton more and ramping up the intesity of your weight workouts. If you are doing moderate weight workouts while eating more then less then more then less... You are basically sabotaging any chance of gaining strength. Find a weight lifting program that works for you. Track you max lift on at least 5-6 base lifts (squats, deadlifts, push press, bench, curls, tricep extension, pull-ups, whatever). Check the change percentage of these on a monthly basis. 90% of your success should be based on this. Eat extra calories until you are at least 155-160. Scale back slowly if you are gaining too much. Once you get 8-12 months into a base intense lifting program you have options. You may be still getting good gains and want to continue - this is the best outcome for you. You could have gained so much strength that you want to scale back. This could happen and you could move to more of an aerobic/rep-centric lifting program. You could have very little change. Then you need to evaluate if you can sustain a lifting program and possibly increase both intensity and time spent. Long-term realistically - I am not sure where you strength level is - you are going to have to increase your strength by 30-200% get to 170-175 and then slowly tune down calories until you hit your goal. You will always lose strength when losing weight. Always. So you have to have "extra-strength" to place past weight loss to maintain muscle. To give you an example 15 years ago I was 240 pounds with about 13% body fat squatting a good 650 pounds. I wanted to slim down for basketball and with just cutting down snacks I was at 205 in 6 months. I could barely squat 475 at that weight even though I was still doing the same intense workouts throughout. Your body fat/muscle ratio is directly correlated to your strength. You can be ripped and skinny as hell and do what you are doing, you can get to 165 and be fat, but you can't do both. Not the answer you're looking for? Browse other questions tagged weight-loss muscle-gain or ask your own question. What can I do if weight decreasing stopped after I reached half of my goal? how to lose fat hips after weight loss?